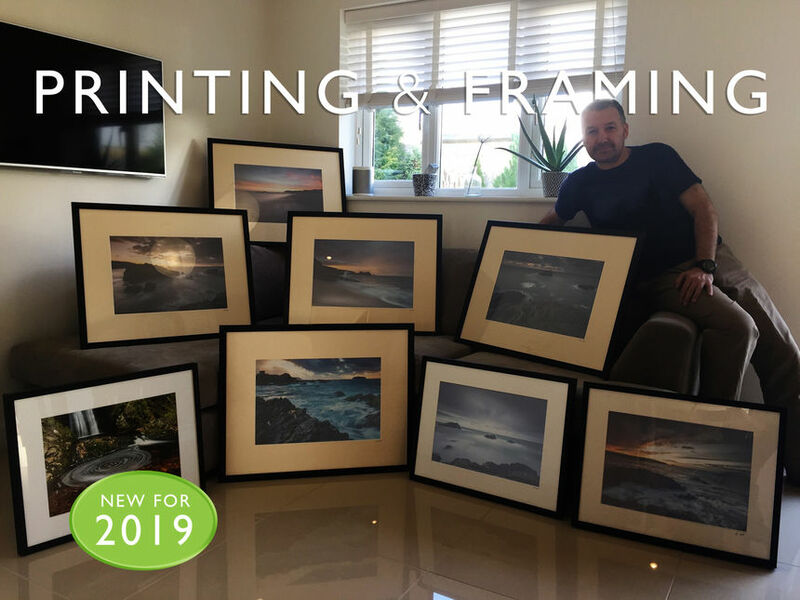 After a number of client requests, for 2019 I have added the option of a printing and framing day to my workshop courses. So now, from composing your framing down on the tideline, to hanging a framed picture up on your wall, you can learn the whole Fine Art Seascape process. The Printing & Framing day is an extension to any 2, 3 or 4 day course. Choose to do it, and your camera stays in its bag and we get up at a more sensible hour, for an invaluable hands on introduction to the dark art of Fine Art printing. I will show you how to select the optimum settings across your digital workflow, to effectively progress an image's transfer from an illuminated computer screen to a Fine Art paper. You will learn the best file formats to save and print from. How to size images. To adapt and balance levels. To download and use icc profiles, and control print settings to achieve stunning print results. This includes an invaluable 'wet' proofing process that lets you see exactly how your image will print while avoiding wasting valuable materials and time. It's a foolproof tool in your photographic skill set that will ensure your images are displayed at their very best while saving money for years to come. For the printing, you will be using a Pixma Pro 10s A3+ inkjet colour printer in tandem with (what I consider to be) the best Fine Art stock for seascapes. The printer choice means, while this latest offering from Canon delivers superb results, its size, format and operation through Photoshop, will relate to any desktop inkjet. So you will be able to adapt the day's instructions to operate your own printer effectively. The paper stock choice is Hahnemuhle's Photo Rag Baryta (315gsm). A wonderfully rich, lightly textured, cotton based substrate that makes my seascapes 'glow'. I love the way it handles whites to hold the highlights in my skies, reflections and waves. Also, it is really thick, so it doesn't sag in the mount. I'll show you how to print with this exclusive paper to achieve perfect results and, with the extra assurance of applying a seal, the image does not necessarily have to sit behind glass. So delicate detail remains strong while the surface is protected and the colours will remain for a lifetime. Thereafter, from making your selection from my choice of stock of frames, you will go on to learn how to mount and frame your print to create a superb artwork. The Printing & Framing day also provides the ideal 'foggy day' backstop, should adverse weather compromise a location shoot. To book this ad-on, take a look at the Prices page for details and costs. Alternatively, if you aspire to creating a very large artwork, or one printed on Acrylic, Aluminium, Canvas etc. We can discuss your options, look at samples, and through my links with a leading UK print service, you can benefit from special discounted rates.